Those are two words not usually thought of in the same sentence…Strength and Humility. They almost seem like opposites. I mean…if you’re strong you’re not going to be humble right? Doesn’t being humble mean you’re weak? Not so fast. Think about it for a moment. Pride (the opposite of humility) is closed. Pride thinks it has all the answers and is therefore closed off to anything new. Pride can’t learn because it thinks it already knows everything. Pride can’t form new and creative opinions because everything has already been decided with “self” at the center. Pride can’t grow in strength because pride can’t admit it’s weak. Because pride is closed to what it doesn’t know, it has a huge “self-shaped” blind spot and it’s vulnerable to quick and deadly attack. On the other hand, humility is open. Humility readily admits it doesn’t have all the answers and is therefore always open to more information. Humility is slow to form hard and fast opinions; keeping an open mind. Humility will defer to others and their knowledge. Humility is always open to grow and become stronger because humility knows its weakness and works hard at becoming stronger. Humility understands that it has blind spots and has formed strong relationships in community who help watch out for sudden attack. Never make the assumption that humility and weakness are the same. In fact, it’s just the opposite. It takes enormous strength of character to choose humility. It takes an iron will to humble yourself because that’s not what the world expects of us. We’re supposed to stand strong, admit nothing, bully and control. But that’s not the example Jesus left us. Only truly secure people can be humble. One of my favorite verses of strength and power in the Bible is in John. In the 10th chapter, when Jesus is talking about His life, he says, “No one takes it from me, but I lay it down of my own accord.” Is anything stronger than that? Jesus chose the way of humility. No one took His life. He GAVE it for the ultimate victory. Through His humble choice, He proved He is strongest of all. Follow His example. 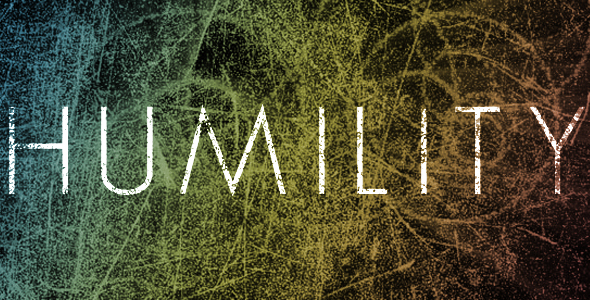 Walk in humility…and strength. « What’s in your hand? Powerful! Thank you for tackling this subject and pointing us to Jesus.